Hi Joshua, I really appreciate your site offering help to fluoroquinolone victims. I too am suffering tremendously every day. I'm 23 yrs old. I took levaquin w/ Flagyl and doxycycline back in may 2009 for UTI. One month later I had severe heart/chest pain which lasted weeks. Shortly after that I was hit with a multitude of neuromuscular problems. Initially I felt like my body, especially my arms, were electrically charged, and subsequently experienced paresthesia, hyposthesia, dysesthesia. Now two years later I suffer from excruciating chronic tendonitis. Typing on the computer and handwriting exacberbate symptoms and I have really bad subluxations/stiffness in joints. My integrative doc aknowledges fq damage and has me on high dose vit c and oral glutathione. I take mag in addition per your advice. My doc thinks I should get a muscle biopsy, what do you know or have to say about this procedure? What other things should I be thinking about? You're doing glutathione, great! That's in The Levaquin Tendonitis Solution ebook. How much Magnesium are you taking? And I wonder if your doctor would be willing to give you a (1 or more) Magnesium IV treatment. Levaquin Tendonitis is no fun, and it's WAY different than regular Tendonitis. Again, how much Magnesium are you taking? I was given Levaquin 750mg (once daily for 10 days)by my urologist to treat a UTI caused by a bacteria that is supposedly difficult to treat (urine was sent off for culture). After just 4 doses, my arm became very sore. I thought it was just a coincidence and continued the medicine. By the 6th dose, I could not use my arm at all without significant pain. In fact, I was in pain 24/7 in my upper right arm/shoulder. I immediately stopped taking the Levaquin and made an appointment with my general physician. He immediately diagnosed me with adverse reaction to Levaquin and prescribed a steroid pack. (Fortunately for me, he had actually experienced the same adverse reaction himself so he knew it was indeed the Levaquin). Two weeks later, my arm showed no improvement whatsoever. Doctor ordered a MRI which showed a Labral Tear and Tendinosis so he referred me to an Orthopedist. I have a desk job that does not require repetitive use of my arm! I told him that I was 100% sure it was the Levaquin and nothing else. He still did not believe me and wanted to give me a steroid shot. I declined because I've read that could make this worse. He then prescribed physical therapy which I am to start next week. However, I'm very nervous that it will make the tear worse since they will be treating me like a tendon tear caused by physical use rather than antibiotic reaction. Do you think physical therapy will help or hurt? Should I start taking magnesium supplements? If so, how much? Since it is my prominent arm that is affected, I'm very concerned about receiving the wrong treatment. 1. Good job saying no to the corticosteroids. 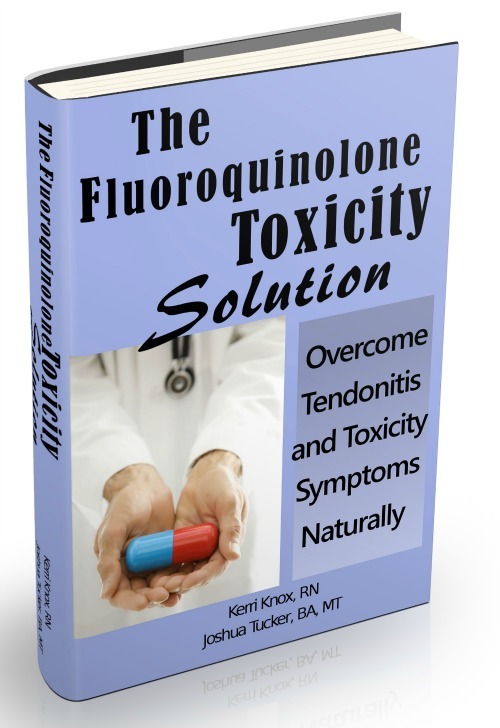 Corticosteroids and Levaquin or other fluoroquinolones is a research-proven bad idea. "He immediately diagnosed me with adverse reaction to Levaquin and prescribed a steroid pack." That's 100% the wrong thing to do. A doctor should know that. "..the orthopedist told me there was absolutely no way that the damage was caused by Levaquin." Shame on that dr. That's exactly the kind of thing that Levaquin DOES do: ongoing significant pain and tendon damage. 2. Physical Therapy has no chance of helping Levquin tendonosis or levaquin tendonitis. PT can't fix cytotoxic side effects. 3. That's great they sent for a culture to see if it was indeed a bacterial infection. Usually antibiotics are given just because, without knowing if it's bacterial, viral, or fungal. 4. How are you now? Following a UTI (urinary tract infection) I was prescribed 500mg of Levoflaxin daily for 10 days. Within the next two days I experienced serious weakness in my leg muscles and distressing neuro-muscular symptoms--tremors/spasms in legs, a sensation of numbness in toes and nerve pain in lower body musculature that is causing uncomfortable nights. (peripheral neuropathy). This condition has persisted ever since. See also, recent FDA Drug Safety Communication, "FDA updates warnings for oral and injectable fluroquinolone antibiotics due to disabling side effects" (HTTPS://WWW.FDA.GOV/DRUGSsAFETY/UCM511530.HTM). The advisory specifically states that this family of antibiotics should not be used for patients with uncomplicated urinary tract infections "because the risks outweigh the benefits in these patients." Given the multiplicity of serious adverse effects and the FDA advisory, I wonder why Levaquin is still being medically prescribed for common UTI symptoms. I also wonder why Levaquin is used so much, so often, and for such minor things (like acne!!!) when it is such a powerful antibiotic with known (and significant) side effects. I wish I had a good answer for you. Unfortunately, I don't.